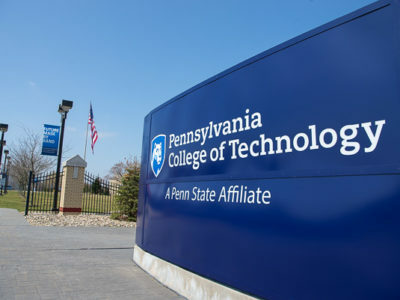 Current and former Pennsylvania College of Technology students who were members of the student organization Minorities Lending Knowledge have established The Start to Finish Minority Student Scholarship at the college. The students are: Kacie L. Weaver, of Harrisburg, a 2016 alumna who earned a bachelor’s degree in applied human services; Kyani L. Lawrence, a former applied human services student from 2013-16 who transferred to a college in her hometown of New Rochelle, New York; and Wilmer I. Clase, of Lancaster, a building science and sustainable design: architectural technology concentration student who is set to graduate with a bachelor’s degree this month. The Start to Finish Minority Student Scholarship gives preference to students who are enrolled full time; have completed a minimum of 24 credits, or one year, at Penn College; have a cumulative GPA of 2.5 or better; have at least one semester remaining before graduation; are a racial or ethnic minority (as defined by the U.S. Equal Employment Opportunity Commission); and are a citizen or permanent resident of the United States. “Minorities Lending Knowledge’s mission is to inspire diversity,” Clase said. “As members, we recognize that respect of individual differences is the foundation of civil behavior, and earning ‘degrees that work’ empowers students to compete successfully in the global marketplace – a powerful combination that more students need to experience. We established The Start to Finish Minority Student Scholarship with that end in mind. I believe this scholarship is a necessity for Penn College students. I have experienced firsthand all of the reasons why we decided to create it. Elliott Strickland, Penn College’s chief student affairs officer, praised the students for their efforts and commitment. “I am so impressed that our students saw a need and worked to establish a scholarship to address it,” Strickland said. “We are clear about our commitment to diversity in our mission and the importance of a community of respect in our college values, and this scholarship is a tangible way that our students are working to continue our progress toward those ideals. Students who wish to apply for The Start to Finish Minority Student Scholarship – or any of the more than 200 scholarships administered by the Penn College Foundation – should complete an online application. Those interested in contributing to a Penn College scholarship or establishing one can send a donation to the Penn College Foundation, One College Avenue, Williamsport, PA 17701; give online; or call the Institutional Advancement Office toll-free at 866-GIVE-2-PC (866-448-3272). Students interested in learning more about or joining Minorities Lending Knowledge at Penn College may email the student organization or call the Student Activities Office at 570-326-4763. I am so unbelievably proud of my friend Wilmer Clase for representing all of the educated minorities and proving our capabilities when given opportunity! Thank you for caring enough to see this scholarship come to fruition! So proud of all three of you! Extremely proud of my great friend Wilmer Clase; very much well-deserved. Always been a hard worker; proud to have him represent us as the educated minority! Great job!